Hostal Patiperro is a cosy hostel located on the beachfront in the city of Pichilemu on the Chilean coast. Our facilities are cozy, warm and very welcoming, so the guests will feel really comfortable at our facilities. In addition, we capitalize our vast experience in the hospitality and tourist sector in order to make the stay of the guests something relevant to me remember. We are located in one of the main streets of Pichilemu. 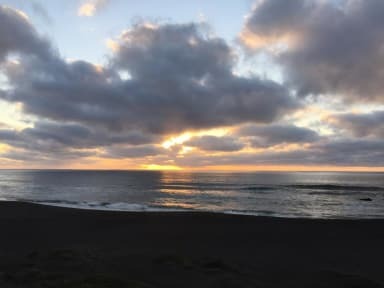 The aforementioned means that we are near to most of the landmarks of the town such as the beach, Pichilemu attraction and the deck view point Infiernillo, amongst other attractions of our town. At Hostal Patiperro we have one double room for couples, one mixed six-bed dorm, and two mixed four-bed dorms. All rooms have a shared bathroom and a sea view. Furthermore, we have a pool, a fully equipped shared kitchen and living area and terraces with sea views throughout. Super social and friendly hostel! We felt very comfortable and enjoyed our stay! It’s about 20 minutes to the main beach in Pichilemu and directly at a beautiful, calmer beach. It had all we needed, besides lockers (it was safe anyway). Sadly there ist mold on the walls of the bedrooms.. but we’ld come back anytime! !